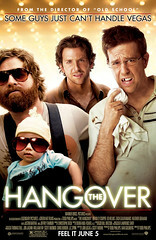 A hangover describes the sum of unpleasant physiological effects following heavy consumption of alcoholic beverages. We have all been there right; headache, nausea, sensitivity to light and noise etc? Apparently if you travel to Las Vegas for a bachelor party (stag-do), the aftermath reaches another level of extreme. I have experienced a fair share of wild nights and adventures but the comedy film directed by Todd Phillips has set a benchmark for waking the next morning and not remembering anything! Not only can't they remember anything but the groom has disappeared, no one can remember the events of the last 12 hours, Mike Tyson wants his tiger back and they have a baby! I watched The Hangover this evening with friends from work and it was well received, consistently funny, unpredictable and defiantly male. With a sharp script and complimentary soundtrack, we really enjoyed the movie and although I have a reluctance to marriage (speech, speech) I'm intrigued by the cultural ritual of the bachelors party (stag-do). Now, onto the best man, who should I choose to arrange the most memorable proceedings? !